If there is strength in numbers, B Corps is a formidable force for environmental responsibility. Environmental responsibility begins in the office, but reaching beyond cubicle walls can amplify the effect. With more than 1,300 members in more than 40 countries worldwide, that’s where B Corps comes in. 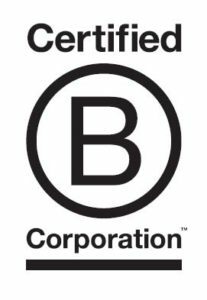 The B Corps initiative likens itself to the Fair Trade seal found on foods and other products from companies that demonstrate responsible business practices. B Corps does the same thing for corporations. To become a certified Benefit Corporation or “B Corps,” a business must have a strong commitment to environmental responsibility. But there are more considerations, too, running the gamut from HR policies to financial transparency. Simply put, B Corps care about more than just the bottom line — they are purpose driven businesses committed to making the world a better place by using the power of the marketplace to benefit society and the environment. The concept is fairly new—B Lab, the non-profit organization that runs the B Corps program, was founded in 2006—but has already attracted big-name companies like ice cream giant Ben and Jerry’s, home products manufacturer Method, and clothing company Patagonia. So far, though, the idea has not taken root in Montgomery County. Plenty of local businesses are taking steps toward environmental responsibility; more than 80 businesses are registered with the Montgomery County Green Business Certification Program. But only four county-based businesses are certified B Corps, according to B Lab’s website. Still, those that are certified are making an impact, and seem to be having a pretty good time doing it. 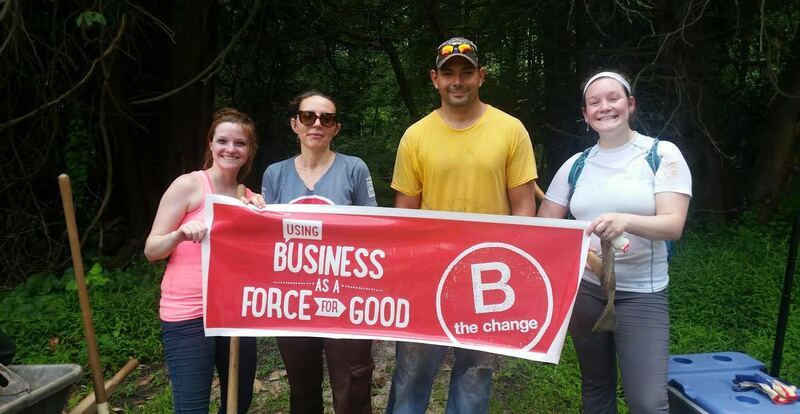 Employees from RoundPeg, a Wheaton communications firm and certified B Corps, gathered in June at the Rachel Carson Greenway Trail in Silver Spring to clean and repair parts of the trail. Polina Pinchevsky, RoundPeg’s principal and creative director, said the company has always been deliberate about environmental and social responsibility. Plugging into B Corps just made it easier. John Jabara, Founder of Savenia Labs, volunteering at the “B the Change in our Communities” event. There is a business case to be made for the effort. RoundPeg employees noted the importance—and fun—of regular volunteering. “It’s great for morale, it gets people together, and it gets you out of the office,” said Jason Moore, RoundPeg’s web specialist. A business whose practices are founded on social and environmental responsibility engage employees in a profound way. And studies show that an engaged workforce translates into increased employee retention, productivity, attraction and creativity. While volunteer events and a mission-oriented business model can empower employees, it is also becoming increasingly important to show current and potential customers a tangible commitment to certain values. How can a business become a B Corps? A good place to start is the free Quick Impact Assessment. You can learn about the different metrics that go into certification and get your “Impact Score,” which illustrates how your business stacks up against the program’s standards. By Scott Harris, Freelance Writer. Read Scott’s other posts on the benefits of environmental peer pressure, birds and climate change, eco-friendly ice rinks, residential solar, and energy savings at Hollywood East Cafe.